Bramon Wine Estate owners, Caroline and Peter Thorpe, planted the first grape vines in 2001. 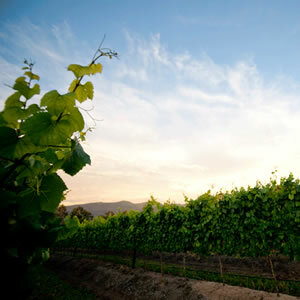 Plett is now recognised as one of South Africa’s “Wine of Origin” regions, and also the smallest. The areas climate makes it more conducive to cooler-climate wines such as Chardonnay, Sauvignon Blanc and Pinot Noir varieties. The alkaline level of the soils allow for the majority of our area wines to have very low sulphites – this is the “additive” that people often have reactions to (i.e. red complexion, allergic-type reactions). There are currently 18 wine farms in the area; from Harkerville to the Crags. Harvesting takes place between the months of February and April. It is dependent upon the amount of sugar currently it the grapes. The wine farms in the Crags area tend to harvest earlier as they are in an area with higher temperatures. The area currently creates 8 Méthode Cap Classique style wines – these are wines that are produced in the traditional Champagne method. The area has become known as a “Bubbly Route”. There are currently 3 wine estates – farms that process and bottle their own wines. Bramon, Packwood and Plettenvale. All other wine farms produce and bottle their wines at the Bramon Wine Estate under the assistance of the master wine maker Anton Smal. Anton Smal was with Villiera Wines in the Franshoek region for more than 18 years before he was brought to Plett. Plett hosts an annual Wine & Bubbly Festival during school holidays during the month of March. Participants taste wines from the different wine farms, experience other locally grown produce such as honeybush tea, olives, olive oil, macadamia nuts and pomegranates and also enjoy music and locally produced artisan foods. You can enjoy the Plett Winelands on horseback, on a horse-drawn carriage, by bus with a guided tour, on a cycling trail or with a guided hike.